Gun crew from Regimental Headquarters Company, 23rd Infantry, firing 37 mm gun during an advance on German entrenched positions. View in Catalog. As the largest repository of American World War I records, the National Archives invites you to browse the wealth of records and information documenting the U.S. experience in this conflict, including photographs, documents, audiovisual recordings, educational resources, articles, blog posts, lectures, and events. April 6, 2017, marks the 100th anniversary of America’s entrance into the Great War. After remaining neutral for three years, the United States reluctantly entered what was supposed to be "The War to End All Wars." By declaring war, President Woodrow Wilson committed the nation to join the other Allied countries in their efforts to defeat the German-led Central Powers. Learn about our current programs and exhibits related to World War I. 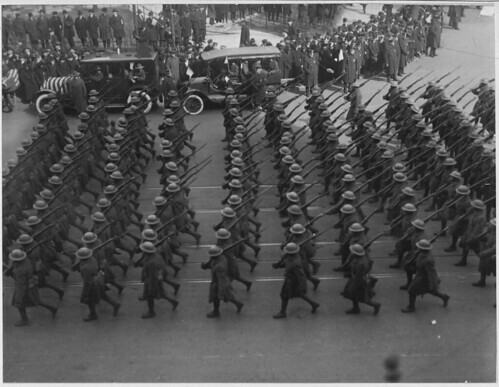 Teach with World War I documents using our DocsTeach tool. Learn about our records relating to individuals. Engage with our extensive collection of World War I moving and still images. Read articles about World War I drawn from our holdings. Become a Citizen Archivist for our World War I records. Explore more records, information, articles and resources at the National Archives organized by subject area. Begin your research with these World War I overview guides and resources from the National Archives. The records highlighted here represent a small portion of the National Archives holdings, many of which have not yet been digitized. Contact the National Archives to plan a research visit. What are people asking on History Hub? This page was last reviewed on March 5, 2019.